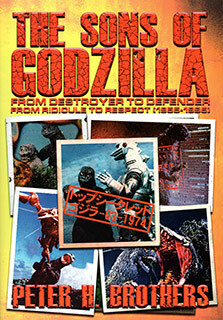 This publication offers an extensive, critical dive into the Godzilla films from 1955 to 1995, excluding the movies of director Ishiro Honda as they were covered in Mushroom Clouds and Mushroom Men: The Fantastic Cinema of Ishiro Honda. The focus is very much a critique of the work, sprinkling in interesting facts related to the productions along the way. In terms of structure, the book is broken out by movies, chronologically. As mentioned, it does not include the Honda films although this doesn’t mean they aren’t referenced. For example Godzilla Raids Again (1955) get its own section, 26 pages long. Within those pages, two are devoted to quickly talking about five other films: King Kong vs. Godzilla (1962), Mothra vs. Godzilla (1964), Ghidorah, the Three-Headed Monster (1964) and Invasion of Astro-Monster (1965). This then transitions to the next subject, Ebirah, Horror of the Deep (1966). Now each covered Godzilla production has two sections to it: “The Film” section and a “Closer Look” section. The former acts as both a retelling of events in the movie with commentary while the latter gives background information on the production but is more often filled with a critical analysis of the film. This includes a wealth of quotes from others, both book authors and websites, for outside opinions on the work. A huge number of sources are used during this process, for full disclosure Toho Kingdom is quoted for the King Caesar analysis we did. To give credit, these quotes are not done in a fashion where it creates an echo chamber, instead varying opinions are given. The author then at times directly responds to the quotes, sometimes openly disagreeing with them. This is particularly overt as it relates to quotes that, directly or indirectly, compare these films with those of Honda. The author comes to the rescue of Honda in these instances, sometimes endearingly while other times it feels overly defensive. On that note, the book is very much set up as a critique of these films. It does include some great facts, the sections for Godzilla Raids Again (1955) and most of the Heisei series movies are the best in the book and more loaded with these. For example, it devotes a full page with different accounts on why the battle in Godzilla Raids Again (1955) is sped up. However, these come secondary to talking about the merits of the movies. Now while the book does offer quotes from others, the author’s own opinion on the various work is often clear. In particular there is a palatable distaste for Ebirah, Horror of the Deep (1966) and Son of Godzilla (1967), which is far enough reaching to be brought up way into the section on Godzilla vs. Biollante (1989). The approach among the films is a bit uneven as well. The Jun Fukuda films and Godzilla vs. Hedorah (1971) in particular are much more focused on the critical aspect of the movie’s quality. In contrast, the Heisei series films also have the opinion angle, but balance this out much better with facts and accounts from the production staff more often. As a result, the later entries covered tend to be the more interesting to read here. Looking at the book as a whole, one question raised is around the intended audience. The multi-page “The Film” section seems appropriate for fans newer to the character who might be less familiar with the movies. However, the supporting “Closer Look” section is written in a way that caters to diehard fans. The type who wouldn’t bat an eye when a quote uses the spelling “Minya” and almost immediately afterwards the author uses Toho’s preferred spelling of Minilla, without addressing this. It also name drops familiar people within the fandom, from August Ragone to Brett Homenick, without much background on them. For the “initiated”, greater context is rarely needed, but for those newer to the character the degree to which these sources are quoted is liable to give the impression they got in over their head. Bottomline, Sons of Godzilla is an interesting publication that covers many films that aren’t often at the forefront of literary work. In a sense, I was more interested to hear a deep, factual dive about these films as it feels like, in English, there is a lot less material out there on these movies as opposed to the Honda ones. However, the approach here is uneven and some of the covered films don’t get that level of fact heavy depth that would have been so welcomed.